Built in 1983 in preparation for the 1984 Olympic Games, the Colorado Springs Olympic Training Center Velodrome is the official training venue for U.S. Olympic and Paralympic track cycling and USA Roller Sports. The Velodrome features a 333.3-meter parabolic banked cement cycling track, which wraps around a 200-meter banked track for roller sports. The 1,000-seat facility is open to the public for community racing, and hosts local, national and international events. 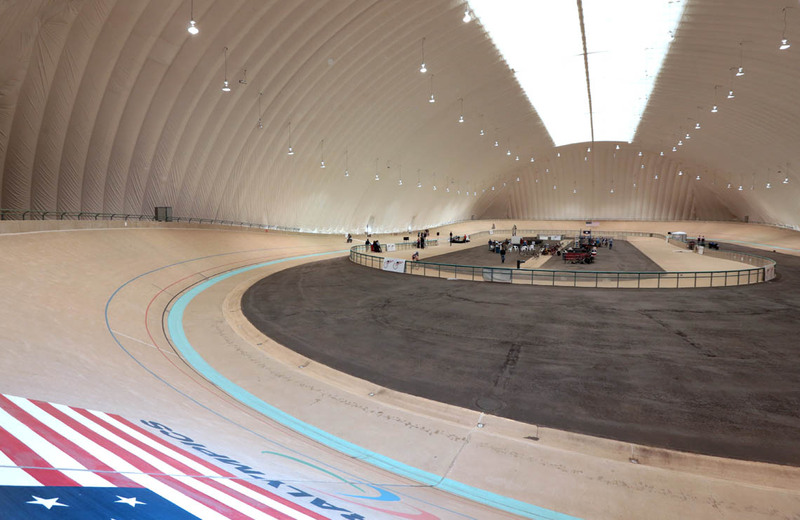 In the fall of 2015, the USOC and USA Cycling jointly funded the addition of a temperature-controlled, air-supported dome that will be in place each fall through spring to allow athletes to train indoors in the winter season. In the spring of 2017, it was decided to leave the dome in place year-round, providing athletes and spectators with a dry and temperature controlled facility, regardless of the season. In this VIDEO, Kelly Springer give us a tour of the Velodrome and Dome. The Colorado Springs Olympic Training Center Velodrome is currently the location for the USARS Outdoor Speed Skating National Championships. The Velodrome at Brian Piccolo Park in Cooper City is the only velodrome in Florida and one of only three in the southeastern U.S. (the other two are in East Point, Georgia, and Asheville, North Carolina). It opened in March 1992 and on April 17, 1993, hosted its first major race. It attracts more than 3,500 athletes annually. The Brian Piccolo Velodrome is used for both competitive cycling and recreational cycling and in-line skating. 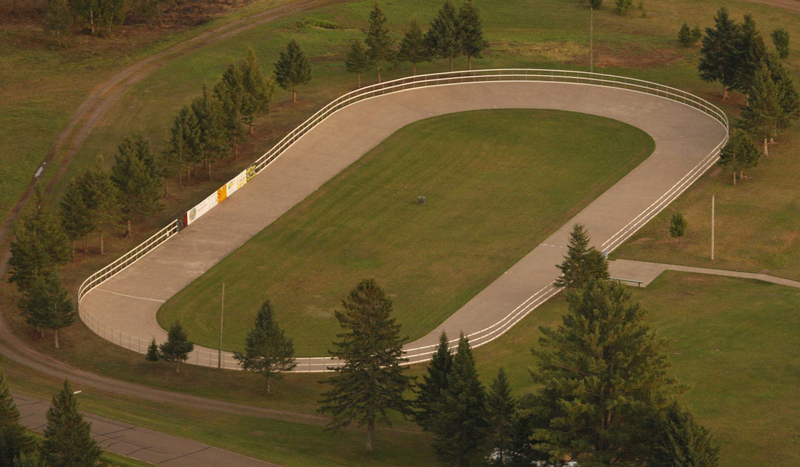 The competitive banked oval track is 333.3 meters long with a maximum 30-degree slope at each end. The recreational track is 200 meters long and has a maximum 10-degree slope at each end. The Brian Piccolo Road Course, adjacent to the velodrome and skate park, is open from 8 a.m. to dusk daily for both cyclists and in-line speed skaters. It is a paved course that includes both 500-meter and 800-meter loops. Except for special events, there is no charge to use the facility, although the park’s regular weekend and holiday gate entrance fee (children 5 and under free) applies. 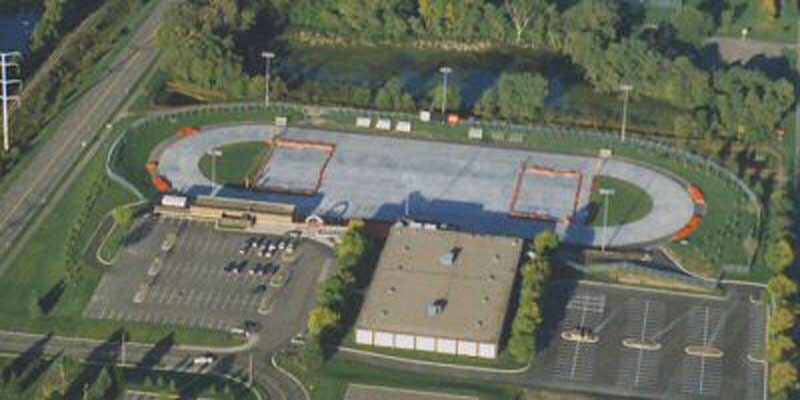 International Inline Complex is the only U.S. facility dedicated to outdoor inline speedskating. The complex features a 200-meter parabolic banked track, and a 500-meter road course with a 100-meter infield for a right hand turn. RV hook ups, pavilions, bar-b-que pits and lots of camping are also being added. If you don’t want to camp here, there is a casino 25 minutes away and lots of motels and restaurants. In the 1980s, Brad Brandner started the Laser Skate Company in Couderay, housed in the former Elementary School building. Laser Skate designed and manufactured inline skates in response to the increasingly popular sport. Brad also dreamed of creating an outdoor parabolic track where skaters could train, and began to do so from 1986 to 1990. 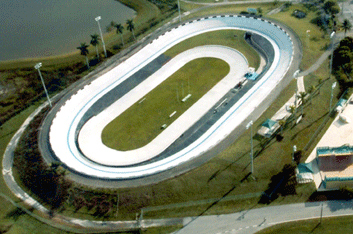 After Brad passed away in 1995, the track and its facilities fell into disrepair. In 2009, activity at the skate track was renewed, as Stacy Akana, a speedskating coach and father to a team of award-winning skaters, purchased and reopened the track, with plans to offer training to skaters from across the U.S. and around the world. Inside the the Roseville Skating Center, the Roseville Ice Arena is a year-round ice arena used for hockey, figure skating, skating lessons and general public skating. Outside, the Guidant John Rose Minnesota OVAL has a 400 meter speed skating flat track surrounding an infield ice area used for hockey or bandy. It is the largest outdoor refrigerated skating facility in North America, featuring an 110,000 square foot slab of concrete. In the spring, summer and fall, the OVAL is also used for inline skating and hosts an aggressive skate park from early May to September. Utah is a leader in the outdoor sports industry featuring many opportunities and facilities for active recreation and is home to many top athletes in various sports. We lack any kind of track racing venue. 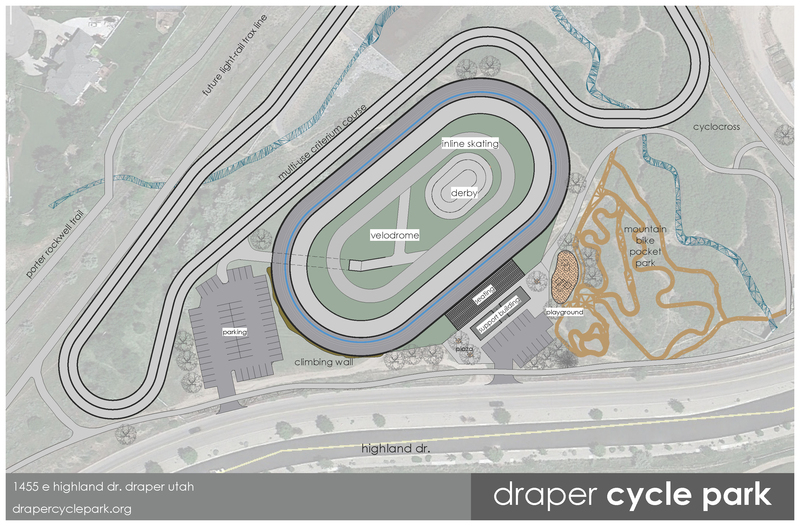 The closest velodromes to us are in California, Colorado, and Oregon. There is real void of in the intermountain-west and we would like to fill that void. The location of the track is approximately 4,600 feet above sea level, which will make it one of the faster tracks in the country. In this high altitude, the air is thin enough that world records can be broken – but not too high to be a limiting aerobic factor. Currently, the Utah Olympic Oval in Kearns, Utah, holds many of the world records in speed skating, which is attributed to its elevation. The Salt Lake Valley also has an Olympic history and is currently home to the “world’s fastest” ice skating oval (the Utah Olympic Oval), a ski jumping and bobsled facility (Utah Olympic Park) and is home to many Olympic and professional athletes. Furthermore, Draper is within thirty minutes of our international airport, allowing easy access for national and international competitions. In-line skating is also going to be part of the velodrome construction with a dedicated area for racing. 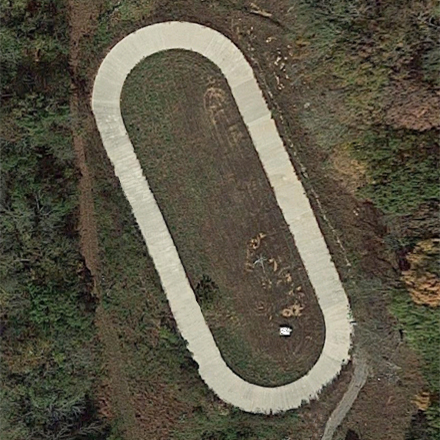 The SDQ Inline Track is a privately owned 200 meter flat banked track. It is located in Triune, TN, near Murfreesboro, TN and Franklin, TN. Terri Bartek-Rowland is the Head Coach of the Sprinters Speed Club. She is also the Sponsor of SDQ Inline Racing. Terri’s mission was to build a track and make it available to anyone in the skating community that has the desire to train on the same type of track that is used at the World Championships. Anyone interested in joining the Sprinters practices at the track or renting the facility can contact Tracy Burdeshaw. We do not have a web site for the track but you can find Terri, Tracy, SDQ Inline Track and the Sprinters Speed Club on Facebook.